Photo by Haim Landsmann/TPS on June 26, 2018 A fire caused by an incedniary kite near Kibbutz Be’eri in southern Israel. 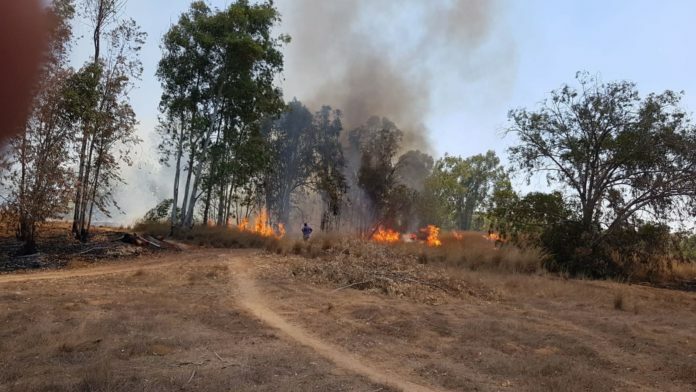 Arson kites from Gaza are likely to lead to a long-term ecological disaster if they continue to cause brush fires along the Gaza Belt region, a leading ecological scientist said Thursday. “So far, more than 11,000 dunams of nature reserve land has been burned. Obviously, that’s wreaked havoc to the area known as the “red south” – swaths of wildflowers and red anemones (are now black). There has been substantial ecological damage at the Carmia, Kfar Am, Be’eri and Besor national park areas. “In addition, when brush fires spread quickly, slow-moving creatures like chameleons and tortoises can’t escape the flames. Faster-moving animals can flee, but the fires burn their food sources, so they’ve got nothing to eat once the flames are put out. More than 100 arson kites have been fired from Gaza at civilian communities and nature parks in Israel since protests began along the Gaza-Israel border fence on March 30. Wednesday, the Environmental Protection Ministry said it would deploy a patrol unit in the Gaza Belt area to measure fine particulate matter known as PM2.5, tiny particles in the air that have been shown to cause cancer, reduce visibility and can cause health problems for individuals with respiratory health problems. The unit will also measure nitrogen oxides and nitrogen dioxide. “In the short term, nature can ‘digest’ the occasional fire. The area has always had them, but they have always been limited. But if the current situation continues and we’ve got fire after fire after fire, it could cause a (permanent) change in the landscape. That means very extensive ecological damage that will take many years to recover from,” Tzoar said. Previous articleBenjamin Netanyahu July 4th Speech: Israel Has ‘No Greater Friend’ than U.S.